There are numerous cookbook and diet books arriving at bookstore shelves every day featuring regional and national cooking traditions, easy-to-make recipes well packaged with large colorful photos. Weight loss books describe specific diets and all the benefits that can come by following them. Despite the number of culinary books that I have read and reviewed, I haven’t really found a book that is so revealing and personal about the relationship between food, a daughter and her father. 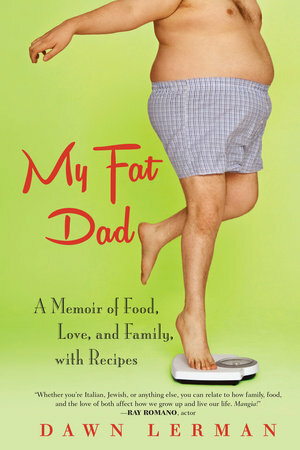 My Fat Dad: A Memoir of Food,Love, and Family, with Recipes has a clear and descriptive title but it goes beyond that. In a series of chapters taken out of her childhood, Dawn Lerman talks about her father’s serious weight problems, the serial diets he used to be on and off, her appetizing relationship with her grandmother and adds amazing and unique recipes for the readers to try. In this fast-paced, moving personal story, only healthy food and love are the winners. Position the baking rack in the middle and heat oven to 425 degrees. Wrap the sweet potato in foil and bake in shallow baking pan until it can be easily pierced with a knife, about 45 minutes. Transfer to a cooling rack and allow the potato to cool completely. Peel the skin off the sweet potato and transfer to a food processor fitted with a blade. Add the chickpeas, olive oil, tahini, lemon juice, garlic, coriander, cumin, salt, and nutmeg, and process until smooth. If the hummus is too thick, add a little extra olive oil, or water and process until the desired consistency is reached. Giveaway for US readers only! Write a comment why you should get this freebie and you are automatically entered. I will only need your name and email address. The winner will be announced on Monday July 25th. Good luck!